In Martinique, in the French West Indies, engraved rocks have been discovered at two sites: one is embedded in the lake forest of Le Galion, in Trinité (on the Atlantic coast), while the other is on the edge of the forest of Montravail, in Sainte-Luce (in the south of the island). Location of the archaeological site of Montravail (after a blank map by Eric Gaba – Wikimedia Commons user: Sting). Unlike most of the sites of the same type, in the Lesser Antilles, the engraved rocks of Montravail are neither associated with the coast nor with a stream or river. They are located 3.5 km from the coastline, on the top of a hill, at an altitude of about 200 m. This area offers a spectacular view of the Caribbean Sea, Diamond Rock (the most emblematic islet of Martinique) and Morne Larcher (an extinct volcano, popularly called “the lying woman”). The engraved rocks of Montravail. In the center, the main rock. Photo: Sébastien Perrot-Minnot. The rock art of Montravail has been reported to the Departmental museum of archaeology of Martinique in 1970, by the academic Jean Crusol. It has been published for the first time in 1973, by Mario Mattioni, who then managed the museum. Subsequently, it has motivated various archaeological studies, in particular, those by Henry Petitjean Roget (1975a, b), Cornelis N. Dubelaar (1995), Sofia Jönsson Marquet (2002) and Fabrice Casagrande (2008, 2014). Casagrande dug test pits at the site, in 2007, as part of a mission of the French National Institute for Preventive Archaeological Research (INRAP, in French). 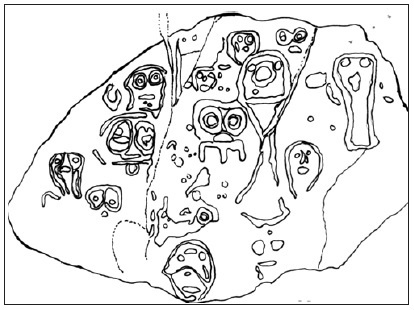 Drawing of the petroglyphs of the main rock (Jönsson Marquet 2002). The petroglyphs have been made by pecking-hammering, on five andesite boulders distributed on a surface of some 220 m². They represent 16 very simplified human faces, showing the eyes, generally the mouth and sometimes the nose; a few are surmounted by motifs difficult to interpret. The main rock, which measures approximately 1.50 x 1.70 m, alone gathers twelve faces; eleven of them occupy a great, smooth surface, produced by the natural breaking off of a block. This kind of stylized face is a recurrent theme in the rock art of the Lesser Antilles. 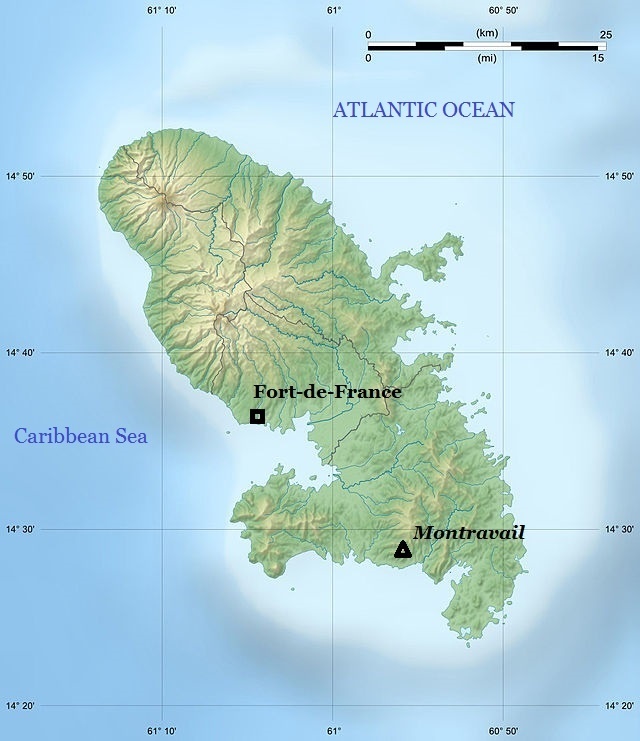 Actually, the composition of the main rock of Montravail evokes other sites of the area, such as those of Trois-Rivière and Rivière du Plessis, in Guadeloupe, Stone Fort River in Saint Kitts or Yambou, in Saint Vincent; yet, the comparisons could be extended to South America, or even Central America. If we go into the details, we note that a trident-shaped mouth symbol, from the iconographic repertoire of Montravail, is also found among the petroglyphs of Le Galion. The archaeological zone of Montravail includes, moreover, three boulders with cup marks of different sizes. These curious artificial depressions often accompany the Antillean rock art. They are traditionally interpreted as polishers, serving for the completion of blades, axes and objects of shell, but they could also be used as grindstones, mortars or recipients for various substances. 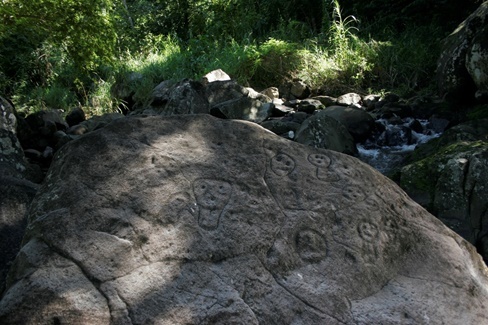 Petroglyphs of Rivière du Plessis, in Guadeloupe. Photo: Gérard Richard. The ceramics uncovered by Casagrande in 2007, and the analogies between the iconography of the petroglyphs and that of certain vessels, seem to indicate that the site was occupied during the Middle/Late Cedrosan Saladoid phase (end of the 4th – beginning of the 8th century). Then, it would bear witness to the Saladoid culture, which developed along the Orinoco River (Venezuela) and the north coast of South America, before spreading across the Antillean archipelago, from the 5th century BC on. The bearers of this culture had an egalitarian social organization, whose framework limited itself to the village. Their subsistence depended, especially, on agriculture. But the nature of the occupation of the Pre-Columbian site of Montravail remains mysterious, in the absence of known traditions or testimonies, relating to the remnants. Nevertheless, we can reasonably suppose that the engravings were linked to ritual practices. Nowadays, the authorities and the public show a particular interest in this Amerindian heritage. In 1996, the engraved rocks were inscribed on the National Register of Historical Monuments of France; four years ago, they were the object of an expert assessment and a cleaning by two members of the Historical Monuments Research Laboratory, Stéphanie Touron and Geneviève Orial, in response to a request of the town council of Sainte-Luce. The town council purchased the land of the rocks in 2009, with the purpose of promoting cultural tourism there. In 2012, a modern monumental sculpture referring to the petroglyphs was inaugurated at the roundabout of Anse Mabouya, on the National Road 5, by the Mayor of Sainte-Luce, Louis Crusol, and the President of the agglomeration community of Espace Sud Martinique, Eugène Larcher. The same year, the municipality of Sainte-Luce put the research unit EA 929 AIHP – GEODE, of the University of the Antilles and Guyana, in charge of the conception of a cultural park and an interpretative center of the Montravail site. This mission in conducted along with works of the National Forests Office of France, aiming to enhance the departmental-national forest of Montravail, which extends over 70 ha. 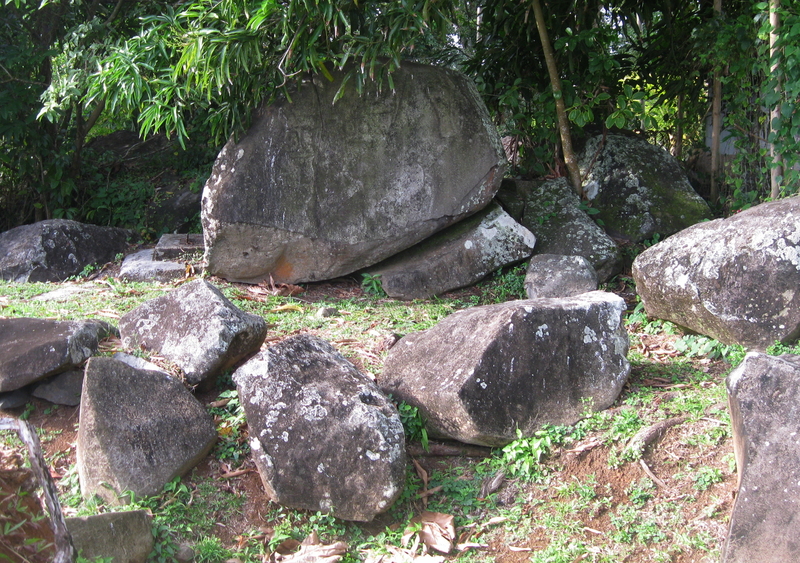 As for the rest, the tourist promotion of the engraved rocks of Sainte-Luce will be destined to fit into broader projects –for example, a trip of the Pre-Columbian archaeology of Martinique, which would connect the site of Montravail, that of Le Galion, the “polisher” rock of Macouba, the vast site of Vivé (Le Lorrain), the Ecomuseum of Martinique (Rivière-Pilote) and the Departmental museum of archaeology and prehistory (Fort-de-France); and a route of the petroglyphs of the Lesser Antilles (Petitjean Roget 2010). 2008 Sainte-Luce : roches gravées de Montravail (Martinique – 972). Rapport de diagnostic, 2007. Institut National de Recherches Archéologiques Préventives. 2014 “Una interpretación de la distribución de grabados rupestres en el bosque de Montravail (Sainte-Luce, Martinique, Antillas Francesas)”. In: Rupestreweb, http://www.rupestreweb.info/bosquemontravail.html (article consulted in May 2014). 2008 “Les pétroglyphes de la Martinique”. In : L’art rupestre dans les Caraïbes. Vers une inscription transnationale en série sur la Liste du patrimoine mondial de l’UNESCO (N. Sanz, ed.) : 284-290. World Heritage Papers, 24. UNESCO. Paris. 1995 The Petroglyphs of the Lesser Antilles, the Virgin Islands and Trinidad. Publications of the Foundation for Scientific Research in the Caribbean Region, N°35. Amsterdam. 2002 Les pétroglyphes des Petites Antilles Méridionales : contextes physique et culturel. British Archaeological Reports, International Series 1051, Paris monographs in American archaeology 11 (E. Taladoire, ed.). Oxford. 1973 « Communication sur les pétroglyphes de la Martinique ». In : Actes du IVe congrès international d’étude des civilisations précolombiennes des Petites Antilles. Saint Lucia Archeological and Historical Society. Castries. 1975a « Notes sur quelques pétroglyphes des Antilles ». In: Compte rendu des communications du VIème congrès international d’études des civilisations précolombiennes des Petites Antilles. Pointe-à-Pitre. 1975b Contribution à l’étude de la préhistoire des Petites Antilles. Ecole Pratique des Hautes Etudes. Paris (PhD dissertation). 2010 « Un projet pour la protection de biens culturels et la création d’un produit touristique : la route des pétroglyphes des Petites Antilles ». In : Patrimoine, tourisme, environnement et développement durable. Europe – Afrique – Caraïbes – Amériques – Asie – Océanie (J. – M. Breton, ed.) : 289-309. Editions Karthala. Paris. 2010 Roches gravées de Montravail : bilan sanitaire, nettoyage et préconisations. Laboratoire de Recherche des Monuments Historiques. Direction Générale des Patrimoine. Ministère de la Culture et de la Communication. Paris.